Posted by paripl110707 in Allergies Watery Eyes, Colds and Allergies, Dimetapp Elixir, Itchy, Nasal Congestion, Runny Nose, Sinus Congestion, Sneezing. 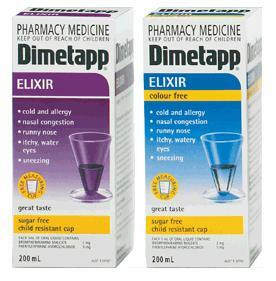 Dimetapp Elixir is a great tasting medicine for Children’s Colds & Allergies. It relieves nasal and sinus congestion, runny nose, itchy, watery eyes, sneezing . Dimetapp Color Free Elixir is also a great tasting medicine for Children’s Colds & Allergies with the extra benefit of being Color Free, because some kids are sensitive to added colors. Dimetapp Color Free Elixir also contains no artificial flavors.